Arrive at Ahmedabad airport and you are transferred to Jamnagar. On arrival check in the hotel and relax for some time. Later Proceed to visit Lakhota Lake & Lakhota Museum. In the evening visit Bala Hanuman Temple, much known for its nonstop Ramdhun since 1956 and been mentioned in Guinness Book of World Records for the same unique attraction. Evening is free when you can stroll in the local markets and shop for famous bandhani work. Later return back to the hotel. Overnight stay at the hotel. After Breakfast check out the hotel and proceed to Dwarka. On arrival check in the hotel and relax for some time Later visit sacred Dwarkadheesh Temple. Take a holy dip in River Gomti and later visit the other sacred places like Nageshwar Jyotirling Temple, Gopi Talav and Bet Dwarka. On your way back visit Rukmani Temple- dedicated to Lord Krishna’s first wife. 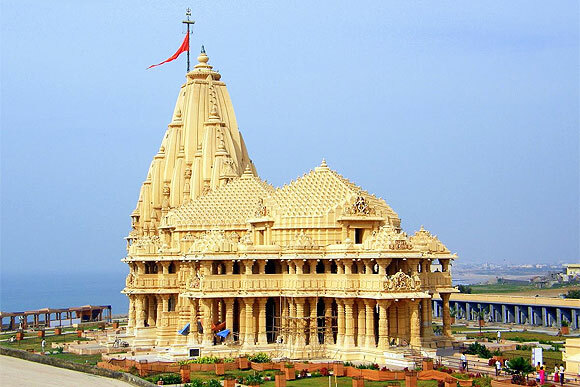 In the evening, visit other temples on coastal area followed by attending evening Aarti at Dwarkadhish Temple. Later return back to the hotel Overnight stay at the hotel. After Breakfast check out the hotel and depart to Porbandar where we visit Kirti Mandir – the famous place where Mahatma Gandhi was born. Later proceed for Somnath. On arrival check in the hotel and relax for some time. Later visit Bhalka Tirth, Triveni Ghat & Somnath Temple. Attend the beautiful and auspicious evening Aarti and later enjoy the Light & Sound show. In evening return back to the hotel. Overnight stay at the hotel. Today after breakfast check out the hotel and explore the beautiful places and temples First we visit Virpur to see Jalaram Temple and Swaminarayan temple. Just nearby to Virpur, we then proceed to Gondal and see Navlakha Palace and Vintage Car Museum here. After the visit, we proceed our drive to Rajkot and arrive by evening. Check in at hotel and relax for some time. Overnight stay at the hotel. 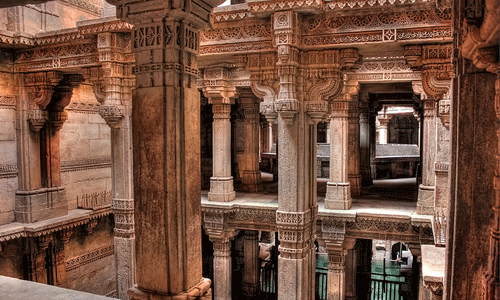 After Breakfast check out the hotel and depart to Ahmedabad En route visit famous Gandhinagar . We visit the magnificent Akshardham temple, one of the wonders of modern world to admire its grand architecture and also see the ancient Adalaj Step Well, the unique Hindu water building built very close to Ahmedabad. Then we visit the peaceful Gandhi Ashram along the banks of River Sabarmati, the place from where Mahatma Gandhi had set out his Dandi march. Today it is converted into a museum. Later you are transferred to airport/railway station to board a flight or train for your onwards journey. If you have not decided yet or wants to customize tour itinerary or hotels listed above in "4 Nights Spiritual Sojourn to Gujarat Package By DPauls", then we can change the travel itinerary and make a personalized, tailor-made holiday package, especially for you. We can modify this travel package as per your itinerary, budget, duration and the tourist places you would like to visit, including transportation and airfare should be included or not. Please fill the form below to contact us.